The Palatine Farmstead, located at the historic center of Old Rhinebeck on the Post Road, is one of only a small number of surviving structures built by first generation Palatine immigrants in the Hudson Valley. This remarkably intact Farmstead, with its house, barn (dated 1770), service buildings and landscape, tells an important chapter in our regional history. 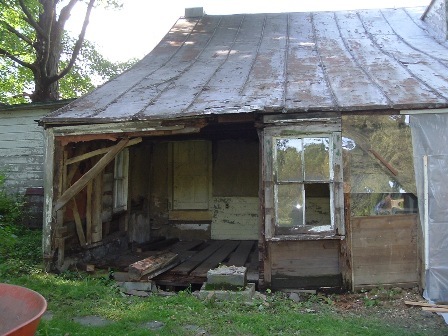 To protect this valuable historic site, it was deeded to the Quitman Resource Center for Preservation by its owner, Rhinebeck Equine, in July 2002.
focus of restoration is described. It was important to conduct a thorough investigation of the Palatine House before restoration work began. This included documenting the condition, the construction chronology, and the history of its inhabitants. The site is rich in archaeological finds. One particular test pit revealed that a barrel had been placed in this location to catch rain water (notice barrel outline in photo to left). 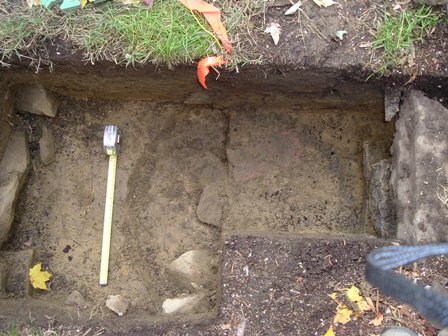 Other test pits exposed a variety of 18th and 19th century china and pottery. Every effort is made to use the original materials of the house. 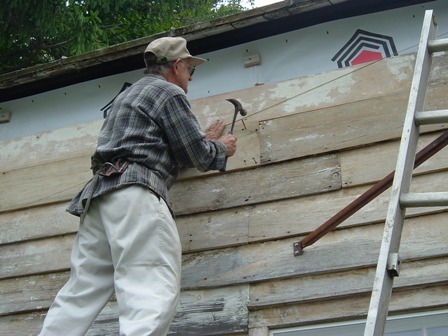 the hole in this clapboard was repaired by using a "Dutchman's patch." 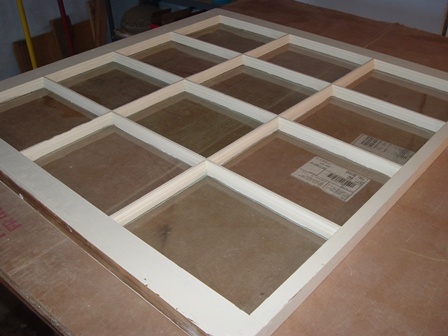 When damage cannot be repaired or restored, reproduction of the original material is required. This rotted molding, found under the roof eave, needed to be replaced. Restoration is painstaking, but results are rewarding. 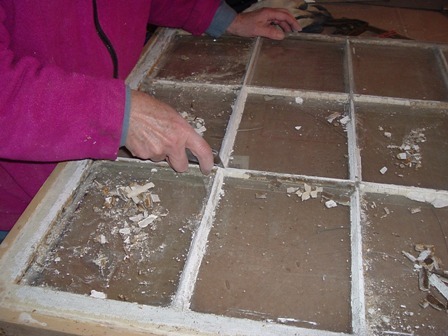 The windows needed to have their calking and crazed paint removed. 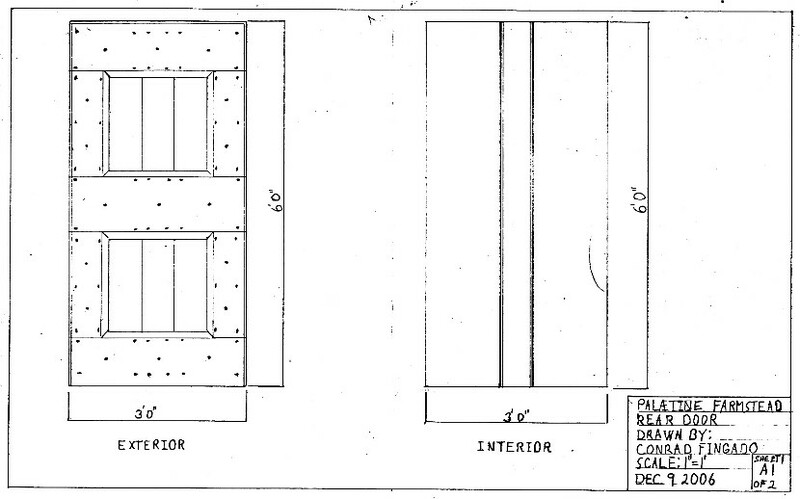 Broken panes of glass were replaced with "restoration glass" imported by Bendheim from Europe. Restoration began on the front of the house. It was soon apparent that the house had suffered a considerable amount of damage. Damage came in many forms: honey bees, water, fire, time and neglect. The framing post to the south of the entrance had completely disintegrated and needed to be replaced, as well as portions of the siding. In the future, a front porch will be reconstructed using archaeology and physical clues found in the framing. An analysis of paint layers, conducted last fall, determined the color of paint to be used for the house exterior. The front facade restoration was completed in the spring of 2005. The rear of the house has suffered similar damage as the front. It was found that the main structure was completely gone and that the house was being supported by the exterior siding and interior wainscoting. The archaeology for the rear of the house was completed in 2006. Restoration began with the repair of the foundation. Traditional timber framing techniques were used to replace the rotted frame. The project was completed in the summer of 2006. 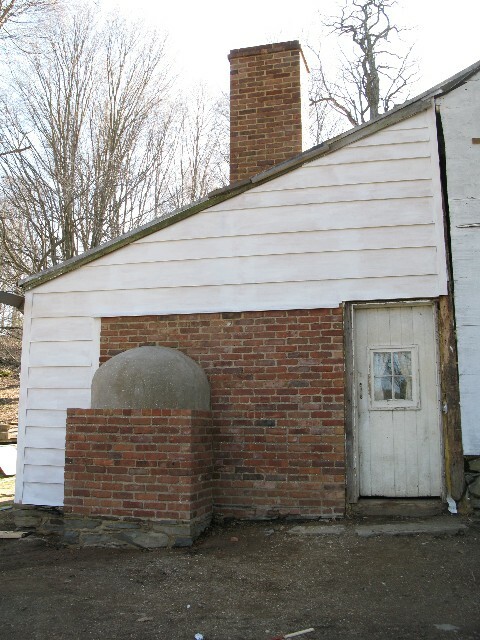 The rear door of the Farmstead is from the original 1727 structure; it tells a story of use and reuse in the 1790, 1840 and 1890 building alterations. The Farmstead Committee has decided that it is time to retire the door and let it become a museum display, to tell the story of the house fabric's use and reuse. 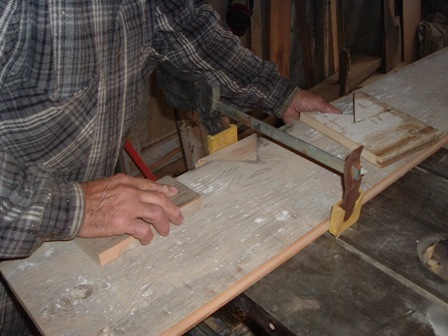 Our master carpenter will be replacing the door as it appeared after the 1840 renovation of the house. When the restoration of the house began, the center portion of the main beam in the basement was found to be rotted. Its sag was particularly noticed on the first floor as you walked from the center hall into the south parlor. 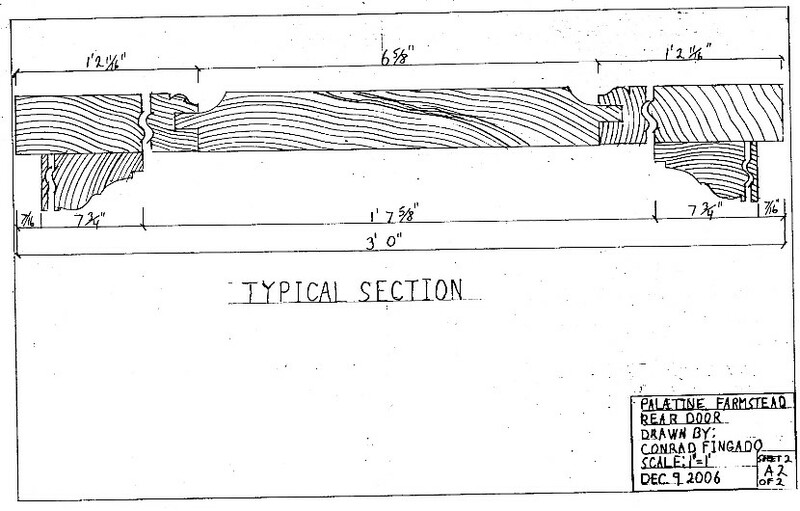 We suspect that this 15" x 7" oak beam had been hewn and installed without knowing that the tree had had a dead interior core. As a result, 280 years later, the rot had slowly eaten away the inside of the beam. The house is in the process of being jacked up, in preparation for the replacement of the rotted portion of the beam. 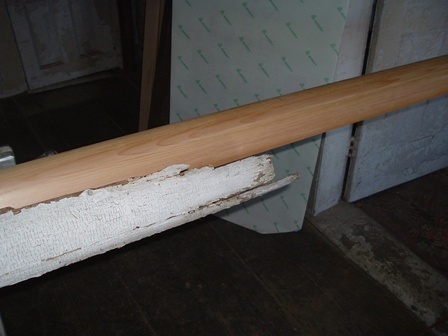 Multiple lolli-columns were used to secure the building prior to the removal of the rotted summer beam. North face of the chimney and fireplace. and donated the rotted and missing moldings. A volunteer workforce has given over 2,600 hours of their time. Legislative Initiative Grants have been secured by NY Senator Steven Saland and NY Assemblyman Kevin Cahill. and the Hudson River Valley National Heritage Area. 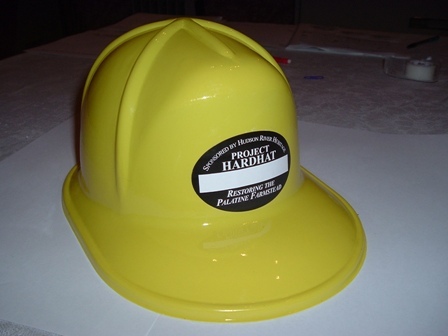 Project Hard Hat, sponsored by Hudson River Heritage for the Farmstead, was initiated in the Fall of 2004 to finance the reconstruction/restoration of the farmstead. For a minimum donation of $50, supporters may buy a yellow promotional hat with their name on it. For $1,000 or more, a donor may purchase a white hat. Join our group to learn about restoration activities and support ongoing restoration work. Restoration is costly and additional public support is needed! For a membership and/or donation form, please CLICK HERE. Please print and complete the form, indicate your level of support, and mail to the address on the form.